Let’s hear it for love…of books! There’s nothing better than curling up under a snuggly blanket with a nice thick book. Of course, I love little books and somewhere‐in‐the‐middle books too. And even though e‐readers are convenient, there’s just something about flipping through well‐loved pages that makes my heart happy. 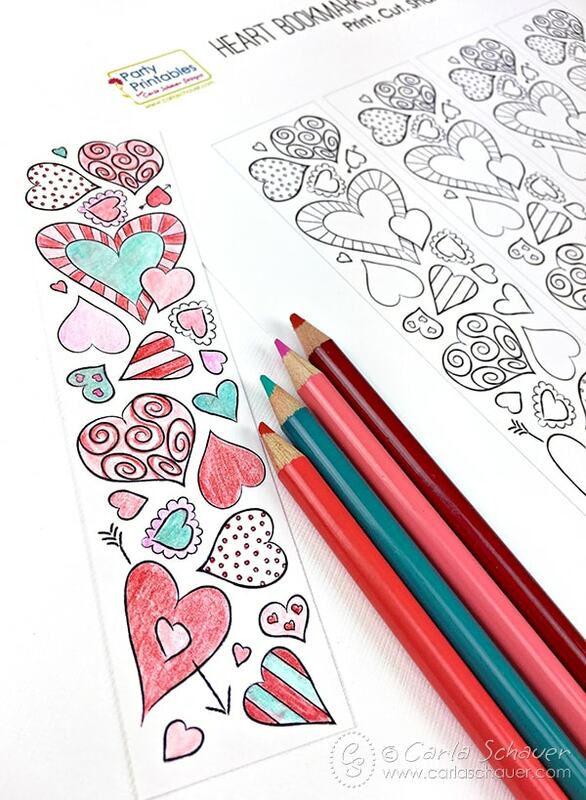 I designed printable Valentine heart bookmarks to share with you, my fellow bookworms, filled with hearts to color. Use your favorite supplies to color one for yourself, or print a bunch to use as kid class valentines. Download the printable bookmarks after the tutorial. If you have a cutting machine, make sure you also grab my free Valentine bookmark svg file. Replace those old Target receipts, losing lottery tickets, and torn up envelopes! Make a pretty new bookmark that indulges your love of crafting and your love of reading. A double win! Print on heavy cardstock or watercolor paper that will stand up to your coloring tools of choice. Color with crayons, colored pencils, markers, watercolors, or whatever suits your fancy. Optional: for extra shine, print using a laser printer and add foil using a foiling machine. I used the Minc machine and gold foil, then used a 3⁄4″ brush to watercolor over the top. Laminate or seal if desired, and punch a hole near the top of your bookmark to tie a bit of ribbon. Skip the store and make Valentine heart bookmarks to pass out at school too. For class valentines for kids to color, print bookmarks onto heavy white card stock, cut out, and glue onto a 2 x 6.5″ colorful red cardstock background. Punch a hole near the top and tie a ribbon through hole. 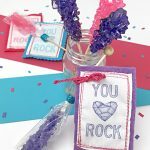 Pair your bookmark craft with my Stripes & Dots printable red party kit and have an adorable coordinated Valentine party without ever needing to run to the party store. I’m sorry you’re having trouble with the file, let me address both your concerns. The bookmarks should print clearly one one page. Did you use the download button at the bottom of the post to save to your computer before printing? You may be experiencing problems if you’re trying to print directly from the low‐resolution image of the page. If you’re having problems printing from the downloaded file, please contact me and I can help you further. You never have to sign up for anything to access my free printables, they all have a download button at the bottom of the associated post to save the file to your computer. The only sign up form on my site is to subscribe to my newsletter for those interested in following me via email. Adorable. The college kids love to color! I’m glad they’re enjoying them! I work for a public library would it be okay to print thsee out and leave on a table for kids on Valentines day? Absolutely, I love the idea! The only thing I don’t allow is resale for profit. I hope the kids have fun with them! This is exactly what I need. Thank you so very much . Super ! Thanks :)it’s a wonderful idea ! As a retired librarian, I say these are a great idea. Thank you Karen! I will definitely look into making that option available. I can not access the download link and I am using my home pc. Where is it at? My cursor does not change to show me where to click, (like it normally does). Hi Leslie, I had a problem on the admin side this morning and didn’t catch the issue with the download program I use. It’s all fixed now. Sorry about the trouble! The file is available for you to download at the bottom of the post. Just click the button and save the pdf to your computer. Enjoy! I can’t click on the link! I can’t either. Can you assist? Sorry about that Alison, thanks for the heads up. All fixed now. Sorry about that Judy, the button is back. There was a problem with an update this morning. Having trouble getting this to Download. I signed up via email etc…but still won’t work. Any suggestions? Lori, I’m sorry about the problem. Some admin updates caused broken links this morning. It’s all fixed now. I’m sorry about the broken link. It’s fixed and should work fine now. The link isn’t working for me either. 🙁 I would love to be able to download these for my students to color next week. Please help! I’m sorry about the trouble Kaitlyn, I fixed the button and you should be able to download the file. There is no link attached to that download? I can’t click on anything… can you please send it to me? Hi Andrea, I fixed the link and you should be able to download the files now. I’m sorry for the trouble, I missed a problem on the admin side this morning. Sorry about that everyone, I updated a few things on the admin side this morning and missed an issue with the download program I use. It’s all fixed now, and should download properly. Thanks for your patience! Thank you. I used the printable bookmarks for my Sunday school this year for Valentines day. The kids love it. I’m so glad they had fun with the bookmarks! Hello! Are we allowed to send the file to Staples or a similar store, to pay for them to print the bookmarks? They would technically be making profit from that. Can you please confirm permission to pay Staples or a similar office supply store to print these bookmarks? You can have them printed anywhere you like, just not resell the files or finished projects. I hope that clarifies. Enjoy! Thank YOU, I needed a new bookmark! I love the gold ones. I will trace with a embossing pen and then emboss them…no mint here…hope it works! That sounds like it would work perfectly! Thank you — very cute! I am going to make myself some bookmarks with these printed out on coloured paper. Will just stick onto cardboard with a ribbon or tassle. Thank you so much for these. I’m going to make some for my dd’s. Have a happy day! You’re welcome, have fun making them! Thank you for making the template available! I made the bookmarks. Going to have this as an activity for the residents at the nursing home where I work in the Activity Dept. They will enjoy this. Thanks for the down load!